Metabolic rate sets the pace of life in organisms, shaping rates of growth, reproduction, survival and resource use in individuals. However, comparatively little is known about how metabolism affects broader ecological scales, such as species interactions, community assembly and diversity. My research address these questions. How does fast-metabolizing, 'warm-blooded' endothermy change competitive and predatory interactions compared to slower, 'cold-blooded' ectothermy? How does thermoregulation drive patterns of biogeography? What is the ecological and evolutionary significance of metabolic power? The rate at which organisms use materials and energy - its metabolic rate - can vary over 100-fold. A high metabolism comes at a great price - the time to starvation is that much faster. What are the advantages and what are the consequences? One place to look for answers is in the ocean, which features endothermic mammals and birds, ectothermic sharks, sea snakes and bony fish, and mesothermic tuna, marlin and great white sharks. The compete for similar prey yet have remarkably different patterns of diversity. Using an energetic framework, my research shows how metabolic asymmetries between these predatory guilds drives patterns of predation, competition, and global diversity (Grady et al, 2019). I am currently extending this approach to the land and the lab. Working with Dr. Anthony Dell, I am tracking movement and interactions rates of insectivorous mammals, lizards and prey over thermal gradients. Were dinosaurs endotherms or ectotherms? Are there macroevolutionary trends in thermoregulation and metabolic rates? What is the temporal dimension of organismal energetics? 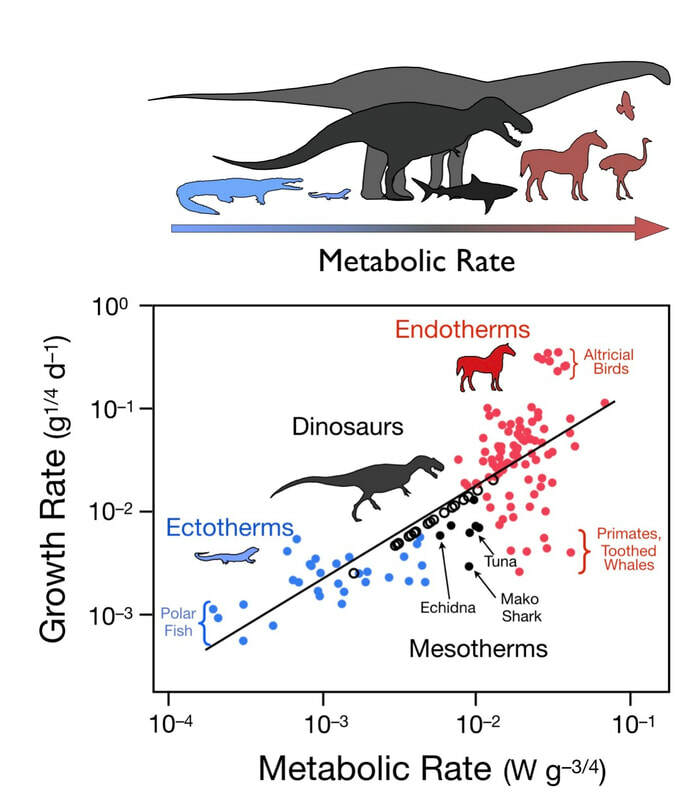 To better answer these questions I compared fossilized growth rates in dinosaurs to growth, metabolic rate and thermoregulation in living animals. The results suggest many dinosaurs may be 'mesotherms' - which metabolically increase their body temperature but do not defend a thermal set point (Grady et al, 2012). This puts them in the company of tuna and great whites. I am currently working to extend the analysis of ancestral metabolic rates to other taxa using phylogenetic methods, and explore spatial patterns of whale evolution from a metabolic perspective. From cellular respiration to global carbon flux, the movement of energy and materials occurs at a variety of organizational scales. New data and theory promises ways to link diverse fields in ecology and reveal general rules. The key to making these connections is tracking abundance in whole communities. Forests are ideal systems in this respect - trees don't move, are easy to count, and metabolic rates like growth and leaf respiration can be measured in the field or lab. Trees differ in their metabolic rates due to size, but also due to differences energetic rates at the leaf level - similar to reptiles (shade tolerant spp) and mammals (gap specialists). I am analyzing tree demography and functional traits to understand how individual energetics and resource availability intersect to determine the assembly of communities. With an increase in long-term sampling networks and animal tracking technology, this type of approach may be extended to animal communities too in the near future. 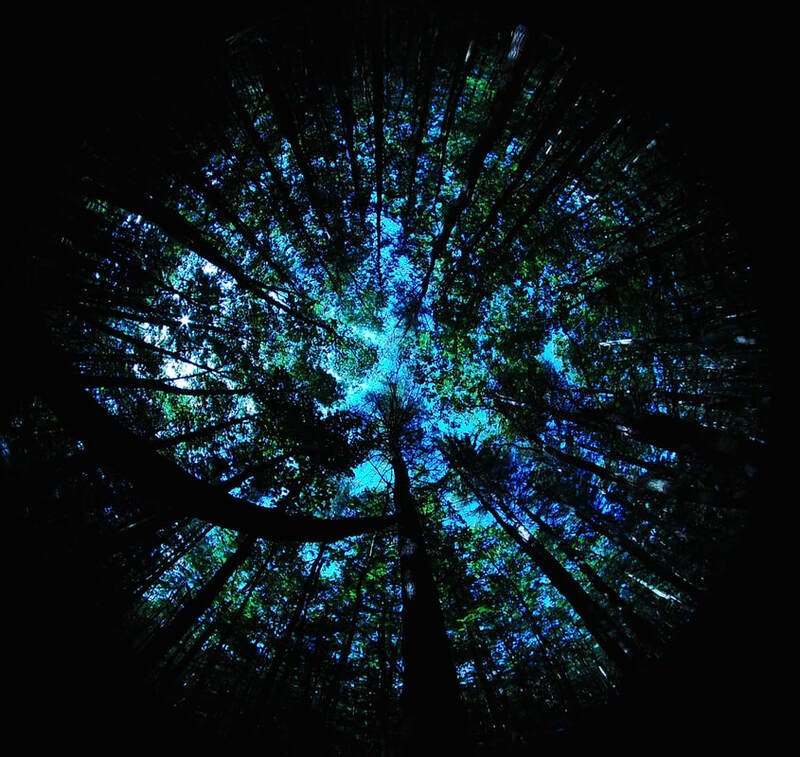 A fisheye view of the canopy at Harvard Forest, MA.